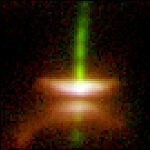 Image far Left: In their paper Kinematics of the HH 111 jet from STIS spectra ( Reipurth & Raga, 2002 ) the research team conducted a long-slit spectrum of the Herbig-Haro object HH 111, obtained with STIS on the Hubble Space Telescope  the area of the spectrograph's data collecting slit is marked in gray lines running top to bottom. They found that knots along the jet ( H, F in image ) exhibit a sudden drop in their radial velocity (modulus) thus confirming that the emission from the knots is formed in shocks. Though noting the need for further study of their conclusions, the research team found "that at the positions of knots F and H, sharp drops in the radial velocity are present. These sharp drops in velocity at the positions of the knots are in qualitative agreement with what one would expect from an interpretation of the knots as "internal working surfaces"* resulting from an ejection velocity time-variability (see, e.g., Raga et al. 1990; de Gouveia dal Pino & Benz 1994). *See section on Herbig-Haro 34 for an explaination of "working surface"
We find that the regions in between the knots have somewhat more confusing kinematic characteristics. 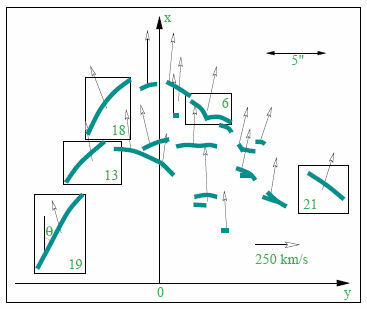 Part of the inter-knot region kinematics can indeed be interpreted in terms of a ballistic jet from a variable source, but other parts clearly do not correspond to material following a ballistic motion." 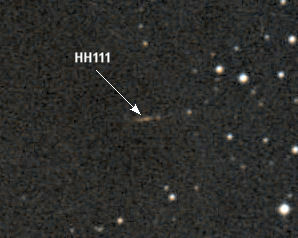 Image at left, HH111 from APOD. "The complex interactions of three stars in the Orion B molecular cloud complex have resulted in the ejection of particles along a 12 light-year long jet. One of the stars in the HH111 system has apparently also been ejected leaving two stars tightly bound in a binary orbit. The spectacular jet emanates from one of these two stars. The complete system is quite complex and involves another less-luminous jet and disks of rapidly rotation gas. In the top part of this Hubble Space Telescope image taken in visible light, successive bubbles are seen to move along the jet. At the bottom in infrared light, a torus of dark dust and gas from which the stars formed millions of years ago can be seen. Protons and electrons zip along near 500 kilometers per second in the HH111 jet, which is about 1500 light-years away." Credit: Bo Reipurth (CASA/U. Colorado) et al., HST, NASA. 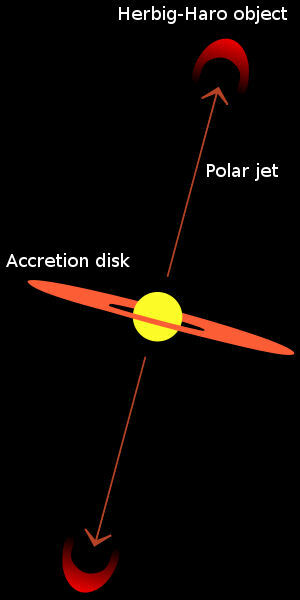 As noted by Bo Reipurth, John Bally and Jon Morse, "The ultimate goal of research on jets is to probe the nature of physical processes that operate within several AU of a young star, to learn about the potential existence of physical conditions that might lead to the formation of planets, and to understand how stars and planetary systems form." This goal was the result of ongoing surveys of T Tauri stars, began in earnest shortly after George Herbig met Guillermo Haro at an astronomy conference in Tucson, Arizona in which the objects were discussed. Images Aladin Previewer: (l) HH111 ( RGB, SERC & POSSII ). 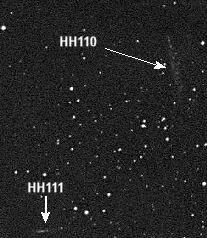 (r) Also located in this region is HH110j just northwest of HH111 ( north is up in the images ). But as we shall see, Herbig-Haro objects have recently thrown science a few curves and surprises, leading to the conclusion that these objects have a mind of their own which seems to defy current thinking as to how they should behave. "Scientists aren't sure what is behind HH 49/50's unique spiral shape. One hypothesis is that magnetic fields in the region are somehow twisting the particle jets; another idea is that the shock waves are creating eddies in the dust clouds which then glow and become visible." On the topic of jets and outflows, the last of these papers ( René Liseau et el. ) noted that "[s]ince their discovery nearly three decades ago, the unexpected phenomenon of outflows in star forming regions has remained essentially unexplained. In particular, the processes responsible for the acceleration and collimation of the flows present one of the major unsolved problems of modern astrophysics". However, the researchers were able to state that with recent observational results now in hand, detailed comparison with theoretical models could be had. 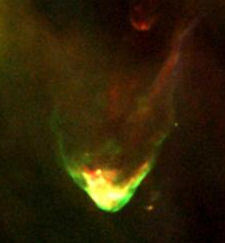 While HH 49, 50 and 111 have all seen intense study into the struture of their respective jets extending behind the shock front ( where, in the cooling gas, electrons and ions recombine to give an emission line spectrum that is characteristic of Herbig-Haro objects ), so too has HH34 and it's bipolar outflowing jets. Shocks and the "Working Surface"
Two opposite jets ram into the surrounding interstellar matter forming HH34, another object with some very distinct characteristics and unknowns. "Some features of HH-34 are understood -- some are not. At the core of Herbig-Haro 34 lies a seemingly typical young star. This star, though, somehow ejects energetic "bullets" of high-energy particles, appearing as red streaks toward the lower right of the this image. Astronomers speculate that a burst of these particles might rebound when gas from a disk surrounding the star momentarily collapses onto the star. Visible near the end of each light-year long jet is a glowing cap. HH-34 lies about 1500 light-years away in the Orion Nebula star-forming region. 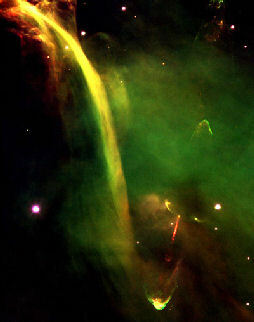 The cause of the large arc of gas on the upper left known as the waterfall remains unexplained." Image from APOD, credit: FORS Team, 8.2-meter VLT, ESO. At right is a drawing created by Gregory Maxwell, illustrating the basic mechanics of HH objects. The images shows material being ejected ( the jet ) by a nearby young star ( protostar ) and colliding at supersonic speeds with the interstellar medium ( ISM ). 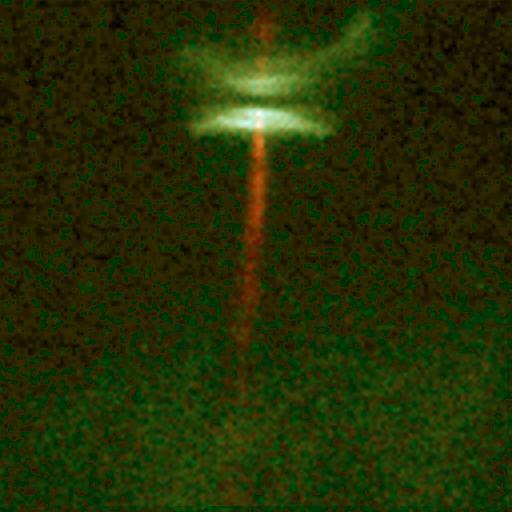 The resulting shock waves of fast moving and heated gases responsible for generating the visible light we observed as the HH object. 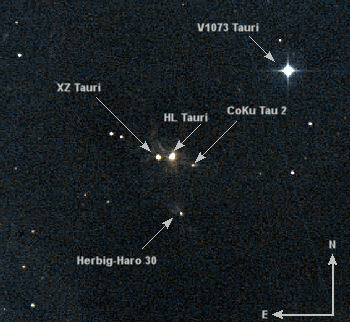 At left is an image from the Aladin previewer site showing the area around Herbig-Haro 30 and the XZ Tauri system. HH30 is located at RA 04 31 37.5 Dec +18 12 25 and is also known as V1213 Tau and 2MASS J04313747+1812244. The image is an RGB composite of several Palomar Observatory Sky Survey II plates in Red and Blue. This particular region contains a wealth of other stellar objects within a 10 arcminute radius of HH30 that includes: Herbig-Haro objects 150, 151, 152, 153, 154, 265A, B & C, 454A, B & C, Lynds Dark Nebula LDN 1551, the variable stars Bad 17, 18 & 19 and the molecular cloud MBM 109 ( just off the lower right of image ), to mention just a few of the 252 objects returned from the SIMBAD data query site. 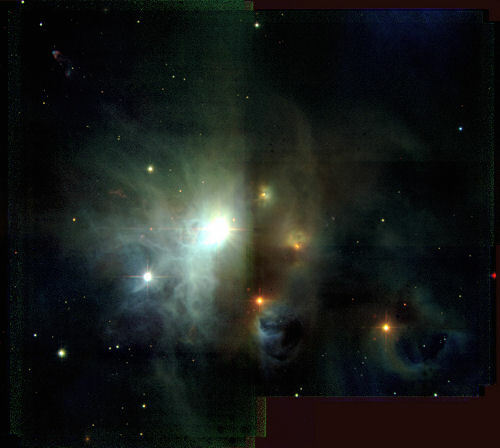 Image at right: "This Wide Field and Planetary Camera 2 (WFPC2) image shows Herbig-Haro 30 (HH 30) the prototype of a young star surrounded by a thin, dark disk and emitting powerful gaseous jets. The disk extends 40 billion miles from left to right in the image, dividing the nebula in two. The central star is hidden from direct view, but its light reflects off the upper and lower surfaces of the disk to produce the pair of reddish nebulae. The gas jets are shown in green." Credit: Chris Burrows (STScI), the WFPC2 Science Team and NASA, from the ESA Science and Technology website. One of the benefits of Herbig-Haro objects stems from their very fast jets and, in stellar terms, their relatively short life spans. Since 1995, several HH objects have had their complex structures and variable speeds well demonstrated in a series of movies composed of the still images taken over the intervening years. 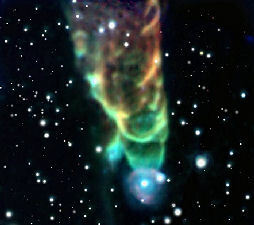 To the left is Herbig-Haro 1 and at right, the bow shock of Herbig-Haro 47. These movies are from Patrick Hartigan's site, Herbig-Haro Jet Movies from HST, where others on Herbig-Haro objects may be found. Karl-Heinz Böhm 1989 Structure and Dynamics of the Interstellar medium from Lecture Notes in Physics, Publisher Springer Berlin / Heidelberg Copyright 1989. The Birth of Stars: Herbig-Haro Jets, Accretion and Proto-Planetary Disks Bo Reipurth, John Bally and Jon Morse, Science with the Hubble Space Telescope -- II. This research was funded by NASA grants NAGW-4590, NAGW-3192, and HST grants GO-5469-93A and GO-5504-93A.